Call of Duty: Black Ops is like a pendulum. That’s one particular idea that stuck with me during a fairly long session with Call of Duty: Black Ops III’s campaign yesterday. Campaign Director Jason Blundell detailed how the history of this particular arch of the record smashing franchise seemed to swing between extremes. The first Black Ops used the Cold War as a backdrop, succeed by a game that plunged you into a near-future war preying on the insecurities our militaries currently face. 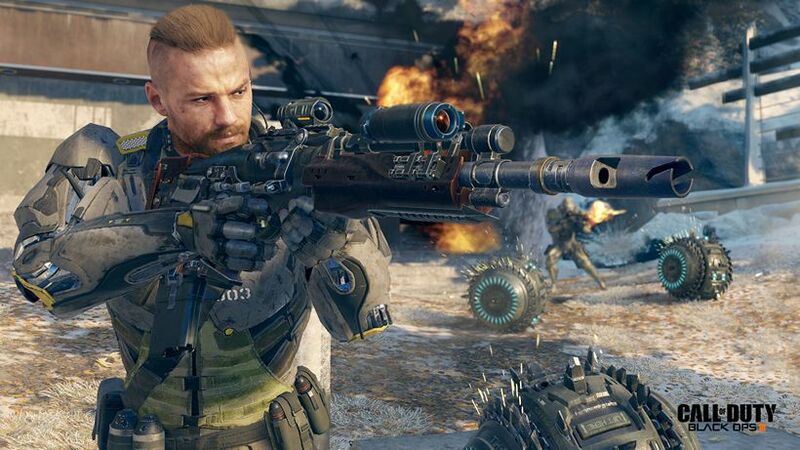 Black Ops III, instead, sits well in the middle. A moment of calm in the mesmerising motion. 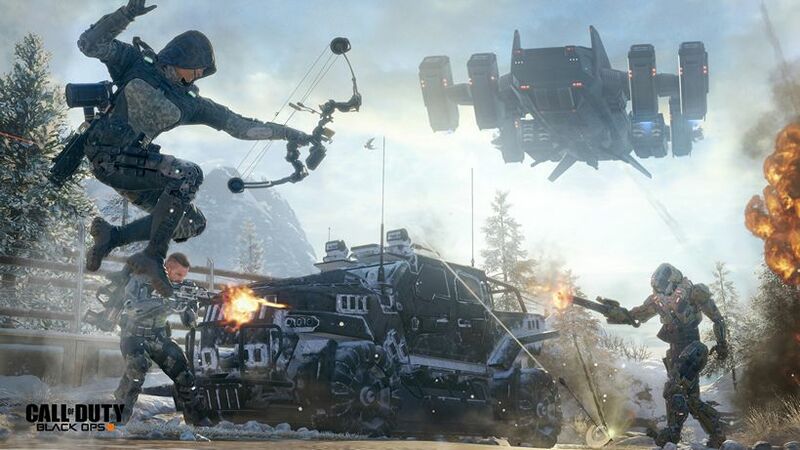 Focusing on narrative primarily, Black Ops III takes place far into the future – a dystopian vision where humanity has allowed biogenetic enhancements to create a social divide similar to the racial lines we draw today. These ideas aren’t exactly unique to gaming in particular, but Black Ops III doesn’t seem to dwell on how it’s affecting day-to-day life. Set in just a single week and a half, the entirety of the campaign centralises on you and your squad – facing increasingly dangerous odds with feet on the ground instead of drones in the sky. 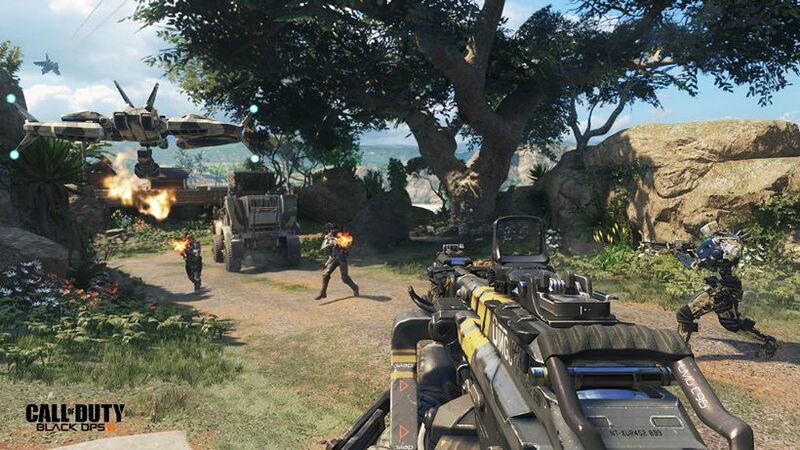 More specifically, Black Ops III rotates around a squad of four characters – whose gender is determined by the four players that can take up their positions within the game. 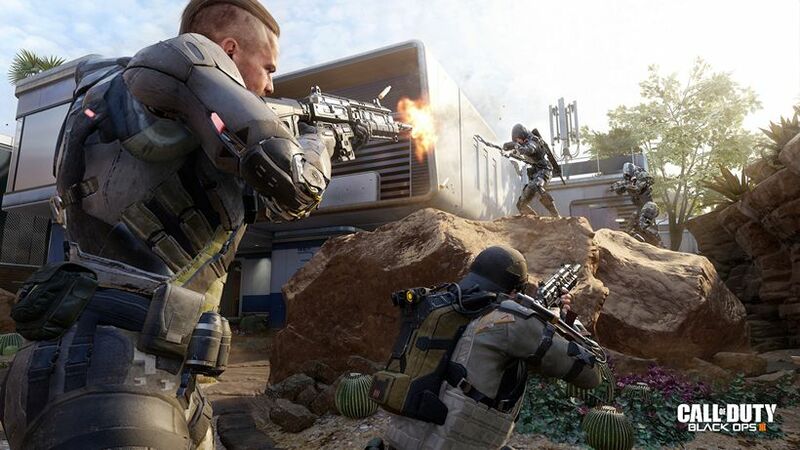 Black Ops III is, first and foremost, built with the idea of co-op from the ground up. In a brand new area called the Safe House, players can share personalised bunker spaces with each other before heading out on missions. You can customise classes, create weapons, run some training exercises or simply bask in the glory of your past achievements. This little slice of downtime serves to group everyone up before embarking on one of the many missions that make up the game, all of which can be played in any order. Ideally of course, you’ll want to be going through it chronologically, but Blundelland his team at Treyarch didn’t want to lock potential players out of content just because one of four hadn’t reached that stage yet. It’s similar to a Netflix model – where you could watch the very last episode first, but don’t really know how or why the story has reached that point. The narrative (which is taking a big chunk of inspiration from the mind-bending games of the first Black Ops) shifts and changes to accommodate player choices. Androgynous names tags accompany fully voiced and interchangeable female and male characters, which is a bit of a jarring shift of focus if you’ve grown accustomed to a particular character looking and sounding one way. It creates a bit of dissonance that will be interesting to observe playing out on a greater scale at launch, but it is a factor that matter little to nothing once the game was actually in session. Sitting down to play a brief demo of the campaign, I was joined by three other players accompanying me on our mission to essentially drop a road on an invading amalgamation of human and robot forces. 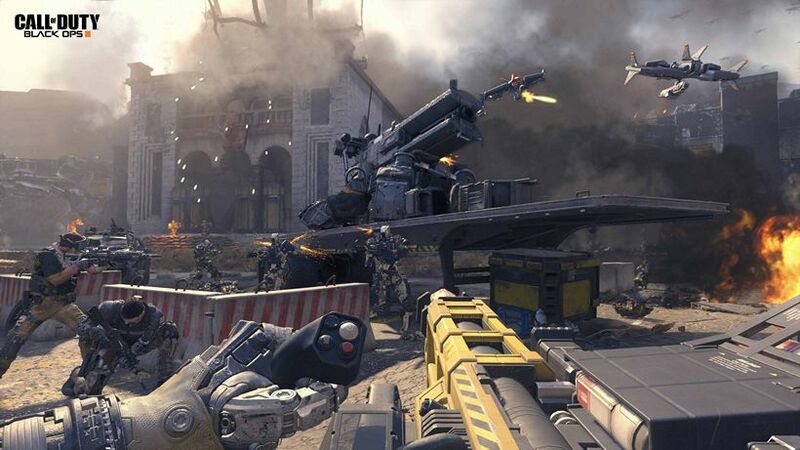 Instead of pushing forward frequently, Black Ops III gives players these small sandbox areas to move around it, flooding the arena-like area with enemies from all directions. It’s incredibly disorienting at first, but I soon realised what a benefit it was to have some backup to rely on. Being set far into the future, all four teammates are connected via a neural interface that allows them to share information with each other. What that translates to in actual gameplay was a tactical mode that presented me with information about the battlefield around me. The ground was shaded in varying colours to indicated the likelihood of me being torn into a slice of Swiss cheese, while also informing me of the various capabilities of foes I was gunning down. The trick here is that the information displayed is all sourced by what my three other teammates are seeing. If there’s an enemy in a blind spot, there’s no red outline appearing on my screen. So forget the idea of a Arkham-esque Detective Mode, and think rather about curated information being beamed directly to your HUD. It’s all presented cleanly too, but not without the ability to turn it all off if you feel your screen is feeling just a little too cluttered. Since you’re sacrificing limbs (and humanity, as the game so bluntly points out with a later cutscene), it makes sense that these augmentations extend to more gameplay facets too. Although we couldn’t mess around with them, you’re able to choose between three different augmentation trees for your classes – which allowed me to pull off a ground shattering pound in case I got a little too crowded. Black Ops III gives you a bit more space to work with, but don’t be fooled – this is very much a Call of Duty campaign through and through. From the minute the game started I was destroying incoming Humvees with a massive rocket pin firing monster of a weapon, while using smaller sub-machine guns and a truly tricked out pistol to keep the waves of enemies at bay. There’s explosions consistently, an ever flowing supply of adrenaline and enough action to satiate the most hungry fans. It’s Call of Duty as I, and countless others, know it – and there’s really not much else you could be expecting now. But there is this allure of something deeper within Black Ops III, no matter how constricted it might be under the frameworks it’s been given to work with. The idea of co-operative play is something the series hasn’t done since World at War (in this capacity). The augmentations that link you and your teammates excites as much as it frightens me as to how the story is going to accommodate with the rushing nature of players and the ever changing avatars. “Black Ops III’s narrative is going to be absurd and unpredictable,” Blundell says confidently – and with the influences of the first Black Ops I’m inclined to believe him. But right now there’s just a lot up in the air to chance that makes me a little more cautiously optimistic. I’ve long considered the Black Ops arch to be the strongest the Call of Duty name has produced, and nothing yesterday swayed me. It just also didn’t feed me enough to know that it’s going to hit all the right notes; something we might have to wait for November to find out.